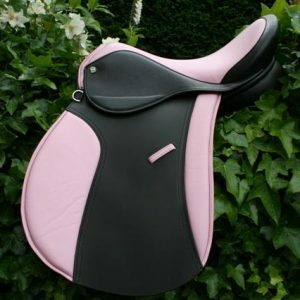 Description: The GP LS saddle, along with the LS jump/event versions, has been designed specifically for horses with large shoulders and where the rider needs a forward cut flap. “Attain Your Inner Balance” Yin-Yang : “Inner Balance” GP LS (for Large Shouldered horses) Please read the testimonial for the (LS) at bottom of this page. The GP LS (Large Shoulders): As you can see in the photographs we cut the panels straighter, behind the shoulder,(pic 3) or even cut it back to accommodate the larger shouldered horse. We then place the knee roll on top of the flap, away from the horses shoulder too. This combination is perfect for the rider who wants a forward flap, but whose horse has large shoulders. This saddle will not hinder your horses shoulder movements and your saddle will not be constantly pushed back by the shoulders either. This design enables us to cut the top flap more forward, for those of you with longer legs, and those who like to ride short. The top flap of the LS “floats” above the shoulder. Compared to traditional saddles design , this lessens shoulder restriction massively, and your horses will move better than they ever have! Guaranteed! The LS range is a truly new, innovative style of saddle that will free up your horses shoulders like never before. The Saddles in pictures 1 and 2 are both made from beautiful, soft, hard wearing Buffalo leather. The cost is £100 extra for Buffalo. 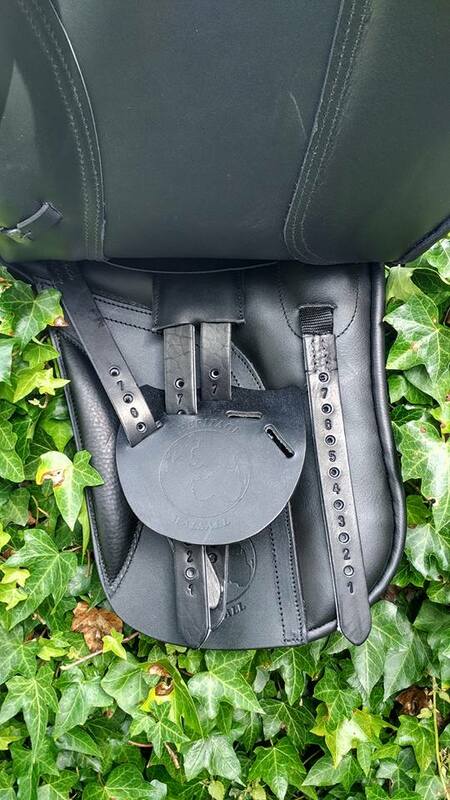 Long, Dressage, “Y” system style, straps/billets option- this is an available option (free of charge) and we can supply the matching short girth if you choose this model. 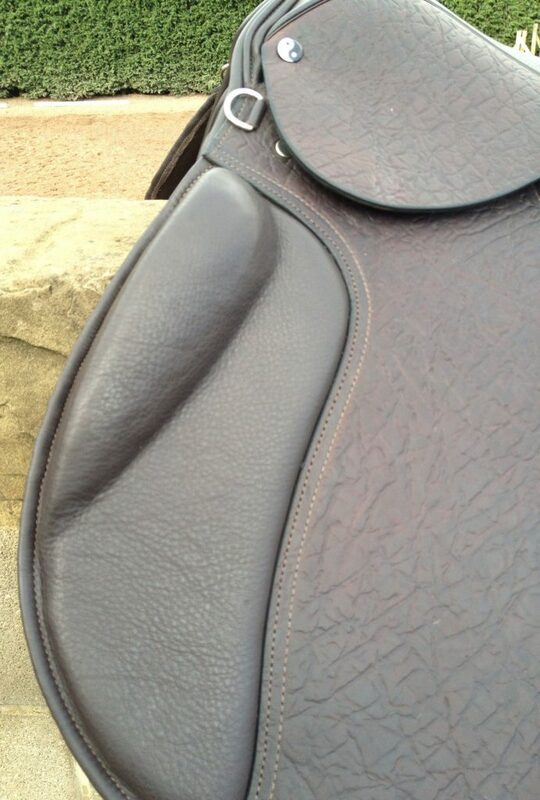 This option removes the bulk of a girth and it’s buckles from under the flap, getting you closer to your horse. You can rest assured that, when choosing one of our Custom saddles, we will choose the correct tree to suit the horse and rider. This may include a higher arch, deeper seat, narrower twist etc, and the panels will be cut, and stuffed, to best suit the horses conformation. 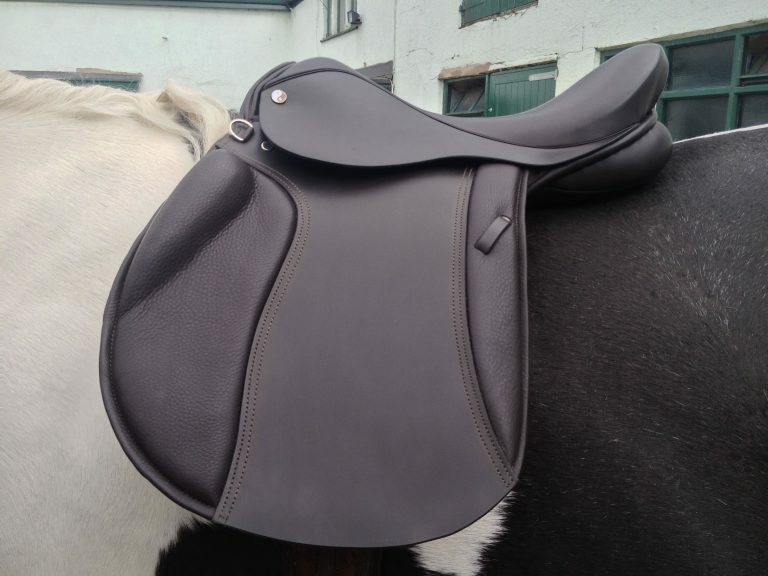 Round cantle by default but choose square if preferred from drop down option above. 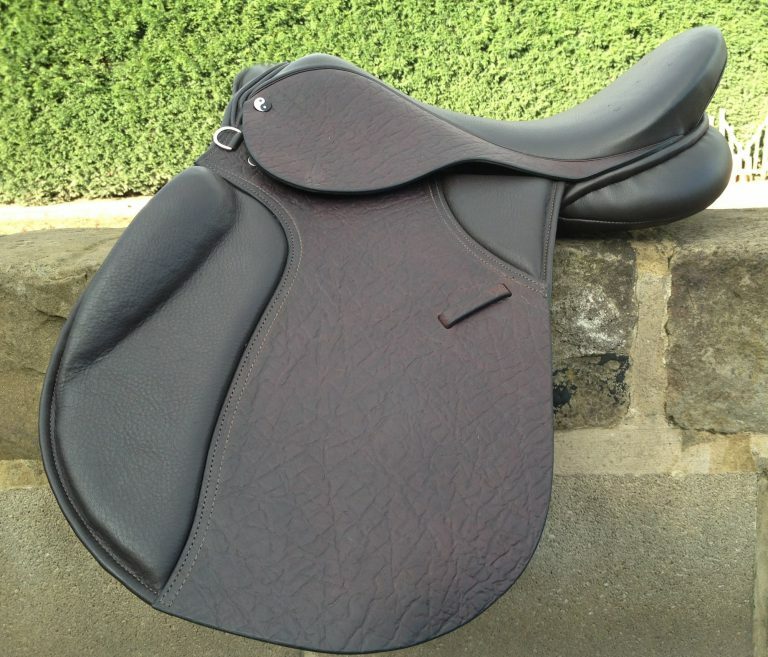 This model is just one of the saddles in our Yin-Yang range and another stunning high quality 100% English Saddle. Let the Yin-Yang range of saddles help you to “Attain your inner balance”. 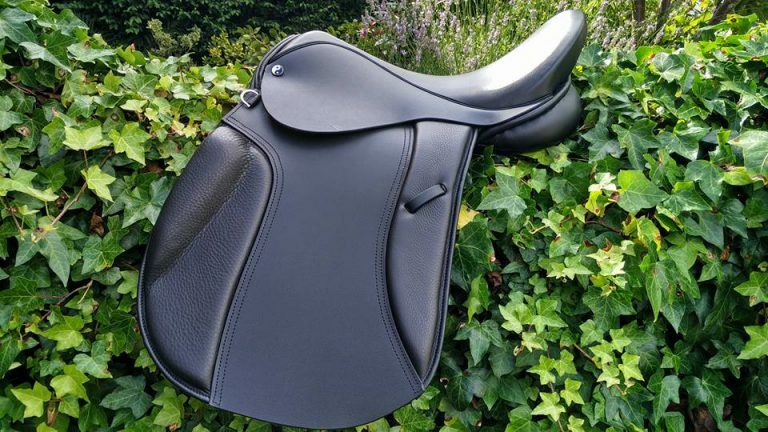 Hi Matt, I just wanted to let you know that the yin-yang MKII (LS) made to measure jumping saddle is everything that you promised it would be. After seven years of trying to find a saddle that would fit both my beloved horse – Punch and myself, I will admit I was sceptical. I had been told so often by saddlers that it was asking the impossible due to my length of leg, I am six foot tall and my horses big shoulders and extremely-wide withers. 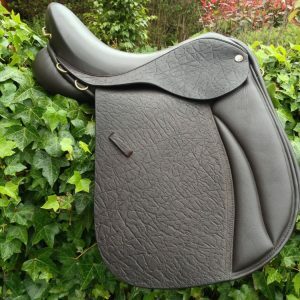 I must have tried every make of saddle you can think of, even made to measure saddles which fitted Punch, but were too straight cut to be comfortable and safe for me. I had nowhere for my long legs to go so my knees stuck over the knee rolls, or over the edge of the saddle. Not good on a horse as sharp as mine! However, at last we have the perfect saddle. 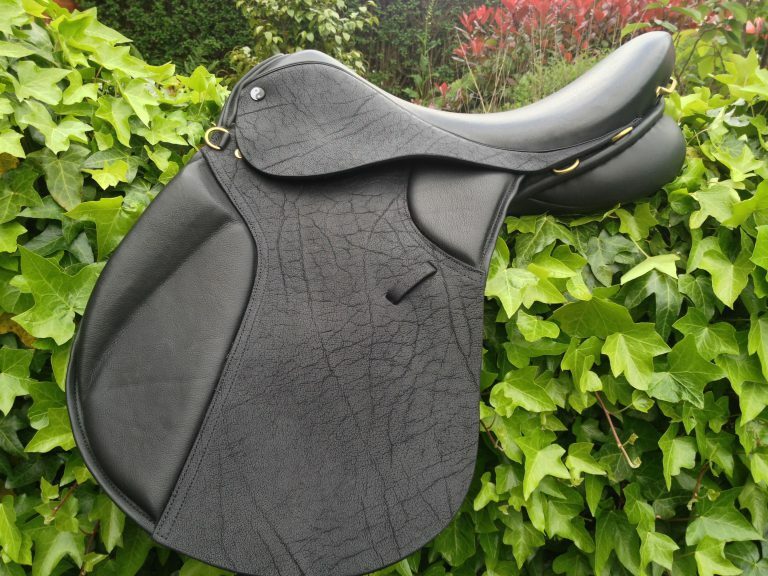 What a fantastic idea the Yin-Yang saddle is – the ideal solution! Already Punch is happier being saddled up and he strides out confidently while I at last have a comfortable ride. I have a lovely soft seat AND room for my very long legs! I am also so much more confident as I have knee rolls where they should be! We are off for a good gallop along the beach next week – with one of my friends -yippee! !I just wish I had known of you sooner. I would have saved myself a fortune in saddles that didn’t fit, despite being told that they did! I may also have saved myself a good few falls due to lack of knee rolls! Still they do say that all good things come to those who wait!! 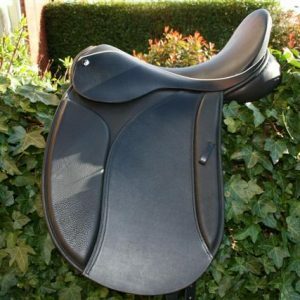 I would recommend this saddle to anyone who has problems finding a saddle to fit. 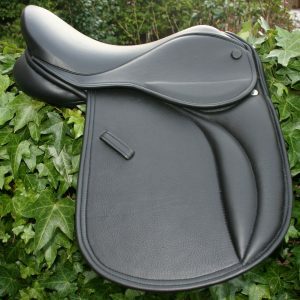 It really does do what it promises and costs no more than other quality saddles. It really does fit both horse AND rider, because that is what it is designed to do. Other saddles may claim to be made-to-measure, but as I have discovered the basic saddle size and shape remains the same. After years in uncomfortable saddles I feel justified in saying that the rider’s comfort and safety are also important. In the past I have always had to sacrifice that- but thankfully no longer! I can now enjoy riding knowing that both of us are thoroughly enjoying ourselves. Cheers Matt. From Ruth and Punch. Wirral, UK. “The Rainbow” – General Purpose Saddle. Choice of leather colour highlights. Ideal saddle for a gift.